You will need to start this ahead of time. The raisins need to soak overnight and the base needs to chill at least 4 hours before churning. It's worth the time. The day before - soak raisins in a bowl with rum, covered at room temperature (at least 8 hours). Stir together 1 cup milk and 3/4 cup sugar, and 1/4 tsp salt over medium heat. Stir and watch carefully. Do NOT boil, just bring to a simmer. Remove from heat. Whisk together the egg yolks and salt. Slowly pour about 1/2 cup of the hot milk mixture into the egg yolks, whisking. The trick is to get the egg yolk mixture very thick..
Next pour all the egg yolk mixture into the remainder of the milk and sugar in the pan. Stir CONSTANTLY until thickened over medium to low heat. Do NOT boil. When it is thick enough to coat the back of a spoon or even thicker (! ), remove from heat. Strain with a wire mesh strainer into a bowl, stir in raisin and rum mixture. Cover with plastic wrap, and refrigerate at least 6 hours or overnight. Stir in 2 cups of cream. Churn in your ice cream maker! 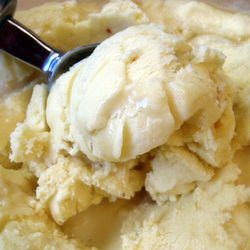 Refrigerate for at least 2 to 3 hours after churning.